Oral hygiene is very important. Did you know that you should start taking care of your child's mouth when they are a baby? It's just as important when you are older. Not only are there health benefits, it helps train your baby to brush. I was able to receive a couple products from Baby Banana to try out. Baby Banana has a variety of product for babies and toddlers. They were invented by a mom hygienist who wanted an easier and safer way for little ones to brush their teeth. The Baby Banana is for babies three months to 12 months. It's made from silicone and is great for teething. It's covered in It's also flexible which is great when you are in the early attempts of infant brushing. I know when Noah was a baby, I was always afraid I would injure him because it just wasn't flexible. 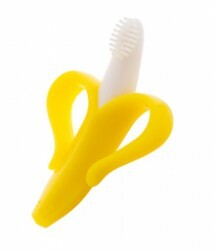 Baby Banana also offers a toddler training toothbrush. The toddler toothbrush is for kids over 12 months. It's also medical grade silicone. You can even put Baby Banana in the top rack of your dishwasher. How easy is that? You will know it will always be ready for your little one. I love that they look the same so your child won't have to wonder what it is when it's time to upgrade to the toddler toothbrush. I had my sweet little friend Jack try out the Baby Banana toddler toothbrush. He loves the cute banana shape and his parents love how easy it is to use. They were having trouble when it came to teeth brushing using another toothbrush. Jack giggles when he sees his Baby Banana come out to play. He can do it himself so there's a sense of accomplishment even at his little age. For more information please visit Baby Banana. You can find their products online at stores such as Target and Amazon.